Flooring contractor Superior Finish Contracts Ltd was asked, at short notice, to remove the existing wood block flooring and install new luxury vinyl tiles. This challenge was especially difficult given the project had to be completed during the half term break and ready for use for when the children returned; therefore, an UZIN system was chosen. Superior Finish Contracts Ltd had to remove and dispose of roughly 6,500 wood blocks; to compensate for the wood block removal, UZIN Deep Fill was used to raise the level of the substrate back up to a suitable height. 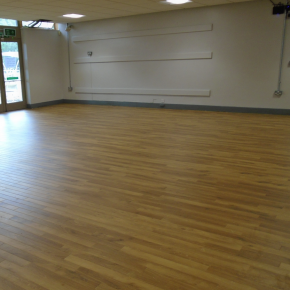 Karndean Da Vinci luxury vinyl tiles were then installed, with the overall refurbishment going very well and completed within the designated timeframe.